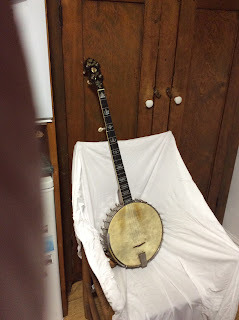 I have decided to sell the best banjo I ever had, which includes several Stewarts, Orpheums, Essexes, and other Vegas. I am playing short-scale 1880s nylon-strung things mostly now and enjoying it. 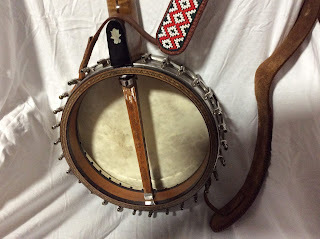 This is a 1923 Vega 'Style X' - a 10 13/16" heavy maple pot with Tubaphone tone ring; bracket ring (so screws to bracket shoes are hidden); beautiful purfling to edge of open-back pot; notched tension hoop; and original shoes, brackets, and tension nuts, open-ended; full 27" Vega scale. The tailpiece is a 1920s Kirschner. The banjo can be fitted with a resonator: Vega used a system of fleur-de-lis plates under each tension nut to make a 'flange'. This was originally a tenor banjo. I got it c.1970 in Canada with a made-up 5-string neck. 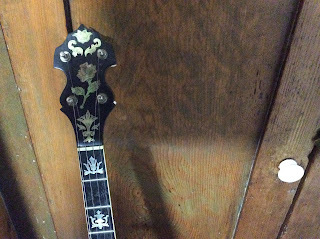 I had the present neck made by a friend, championship luthier Wayne Fairchild of Michigan, who was at that time making banjos, mostly 4-string, in the $10,000 class, and is now in the Banjo Hall of Fame. The maple came from North Carolina, near the Virginia and Tennessee state lines, and was a blank. Wayne cut and reversed the pieces with an insert, and added a heel-adjustable truss rod. The serial number 57040 (indicating 1923) appears on the wooden perch pole/dowel stick and on the pot. The bound ebony fingerboard is mounted on multi-layered veneers and carries a fancy 1920s pearl pattern; positions are side-marked with dots. There is a full set of old Stewart-MacDonald planet-geared pegs with white buttons. The deal includes a pair of Scruggs/Keith pegs for 2nd and 3rd strings, old type; an insulated, waterproof, padded, zippered, semi-rigid case by Betty Vornbrook, champion fiddler of the Reed Island Rounders, Hillsville, Va, who makes cases etc. under the brand name Autumn Wind; and a beaded strap [visible in the photo on left] I had made about thirty-five years ago by a Cree lady who was 82 at that time. The Style X tenor was used by King Oliver's Creole Jazz Band and Armstrong's Hot Five and Hot Seven bands. Kuhn describes it as 'possibly the best open-back banjo ever built'. This banjo, picked with a fingernail, is louder than any comparable Stelling, Gibson, you name it... 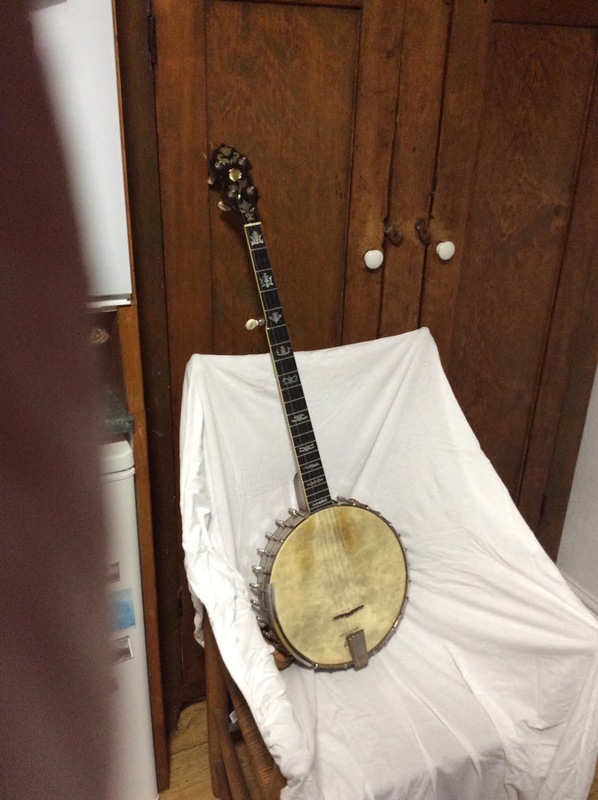 It would be a lifetime banjo for a serious old-time picker. Click on any of the photos for an enlarged view. For more details, contact Alec by e-mail.